The sugar snap peas at Tumbleweed Farm are abundant and wonderful. And while my favorite way to enjoy a fresh snap pea is raw, straight off the vine, I think these grilled peas are the next best thing. 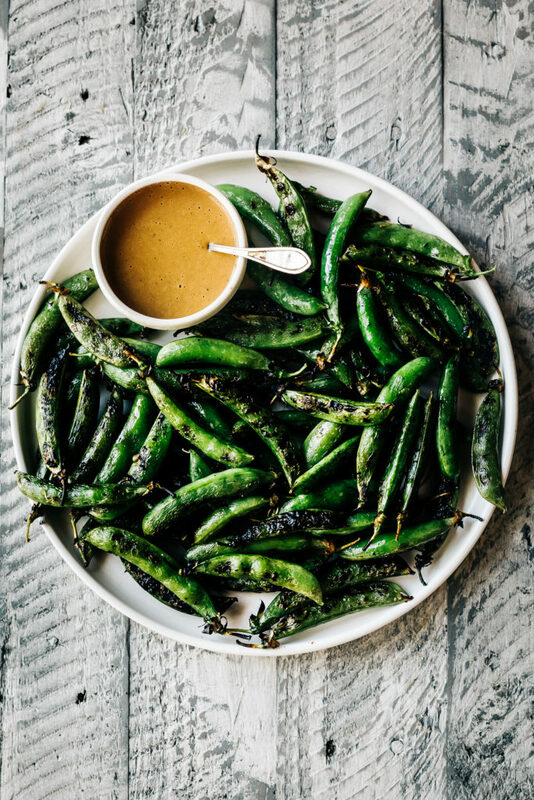 We whipped these up for a happy hour snack and dipped the lightly charred peas into a spicy peanut sauce. If you’re looking to make this a complete meal try grilling some tofu or chicken, whip up some rice and serve with the dipping sauce for a simple dinner. Regardless if you make this a meal or happy hour snack I’d recommend serving these tasty snap peas with a cold beer and good company. Whisk together all the ingredients for the peanut sauce until smooth and creamy. Taste test and adjust seasonings as needed. If the sauce is too thick add a touch more water to thin. Preheat an outdoor grill to medium-high heat. Toss the peas with the olive oil and salt. Set a wire rack or grill basket on the grill grate and grill peas, turning occasionally, until lightly charred. About 4 minutes. Serve peas with the dipping sauce and serve warm or at room temperature. I love sugar snap peas – such a good idea to grill them! And we make a lot of peanut sauce around here, so I’ll have to try pairing the two.